The British Academy of Film and Television Arts named Wright among the 2015 group of BAFTA Breakthrough Brits for her role in the award-winning film Urban Hymn. She achieved global recognition for her portrayal of Shuri in the Marvel Cinematic Universe films Black Panther (2018), Avengers: Infinity War (2018) and Avengers: Endgame (2019). In 2019, she received the BAFTA Rising Star Award. 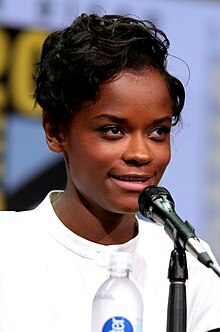 Wright co-starred in the 2018 film Black Panther, playing the role of Shuri, King T'Challa's sister and princess of Wakanda. Part of the Marvel Cinematic Universe, the film also starred Chadwick Boseman, Michael B. Jordan, Lupita Nyong'o, and Danai Gurira. Wright won the NAACP Image Award for Outstanding Breakthrough Performance in a Motion Picture for her work in the film, and reprised the role in Avengers: Infinity War, which was released later that year. Also in 2018, Wright appeared as Reb in Steven Spielberg's film adaptation of the 2011 science-fiction novel Ready Player One. Wright features as one of the cameos in Drake's music video for "Nice for What". In 2019, Wright won the BAFTA Rising Star Award. In April 2019, Wright appeared alongside Donald Glover and Rihanna in Guava Island, a short musical film released by Amazon Studios. Later that month, The Hollywood Reporter reported she is set to star in a adaptation of Agatha Christie's Death on the Nile. ^ a b Kelly, Sonaiya (30 March 2019). "'Black Panther,' 'black-ish' win big at the 50th NAACP Image Awards". Los Angeles Times. Retrieved 31 March 2019. ^ Ritman, Alex (18 April 2019). "'Black Panther' Breakout Letitia Wright to Star in 'Death on the Nile' (Exclusive)". The Hollywood Reporter. Archived from the original on 18 April 2019. Retrieved 18 April 2019. This page was last edited on 24 April 2019, at 10:38 (UTC).